The photos appearing on this post were taken by me on 35mm slide film in 1985. They have been scanned at 3600dpi. Declan and Connor wrote a descriptive piece about the Australian Desert. This post will share some photos of Australia's arid centre. 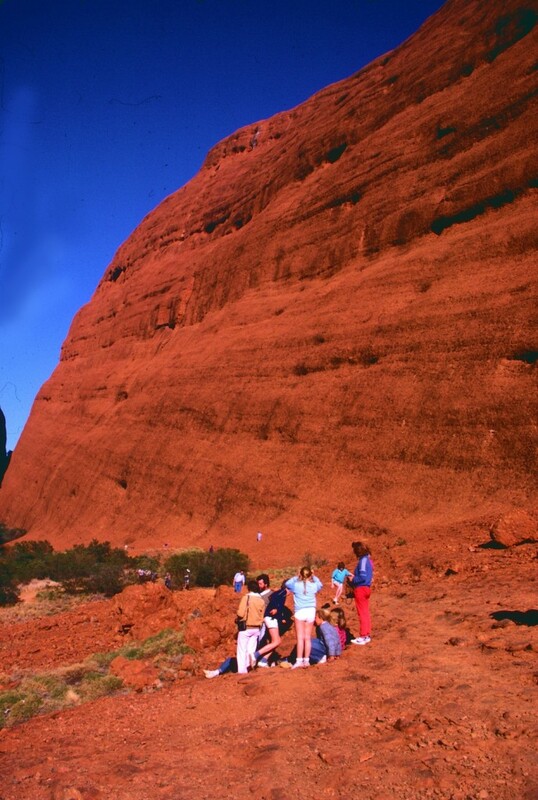 Back in 1985, I organised a trip for some families from my school through Australia's centre. Our journey in the minibus I drove covered over 6500km. 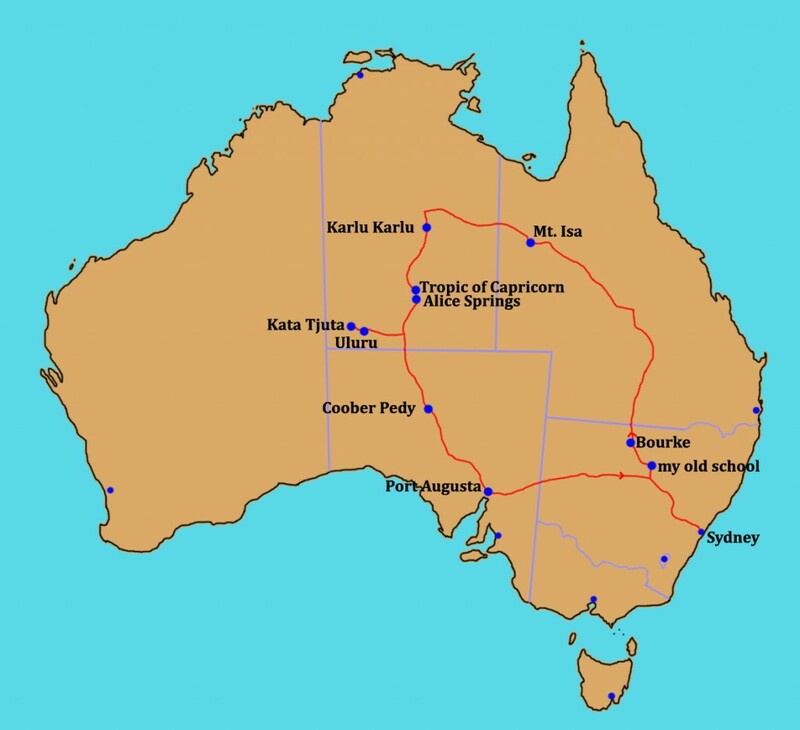 Below shows the journey we took from Sydney to the north, through central Australia and back to Sydney. 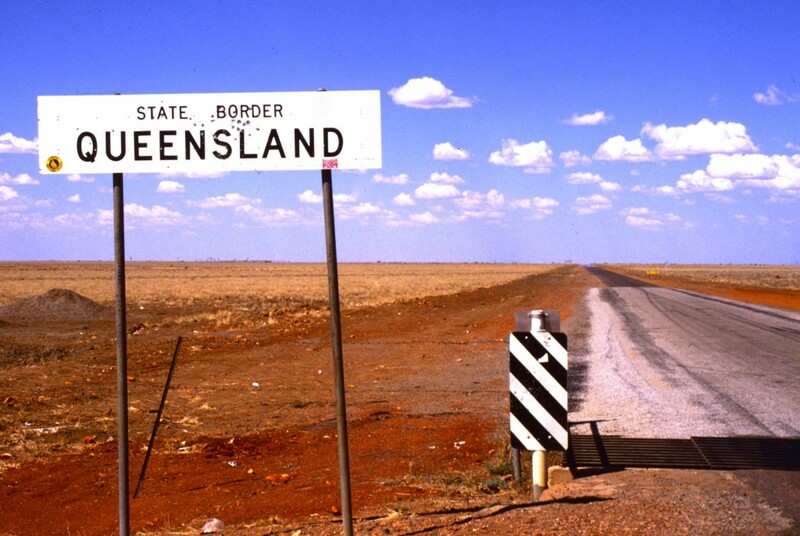 The photo below shows the border country to the west of Mt Isa on the map. 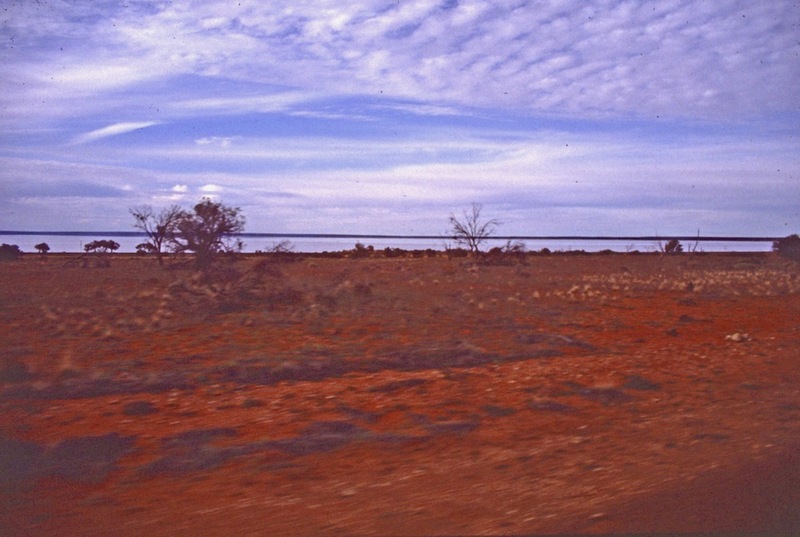 Some parts of Australia are very flat with few trees. Occasionally, hills can break the dry scenery. You can see from this photo including two of our group just how large the rocks are. The rocks aren't balancing. 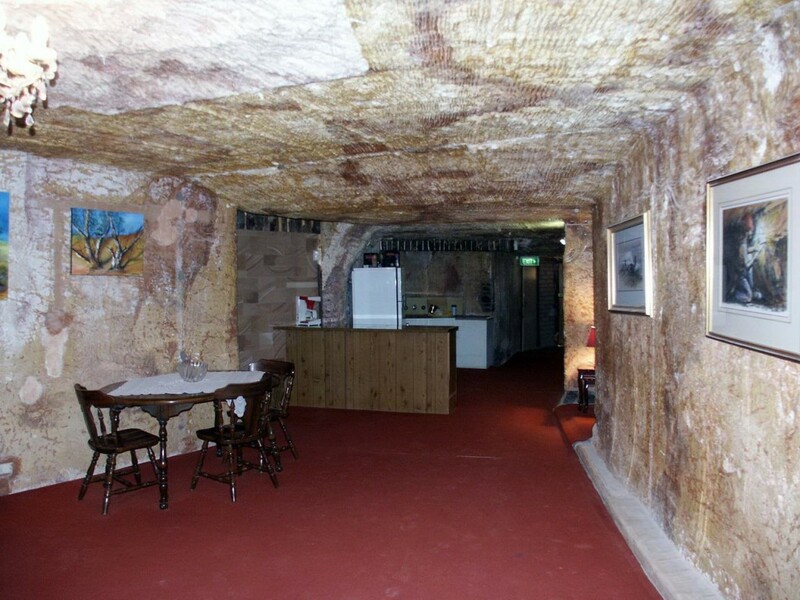 They have been eroded over time with the base of the upper rock slowly wearing away from the base rock. Eventually enough rock will erode away and the upper rock will fall. 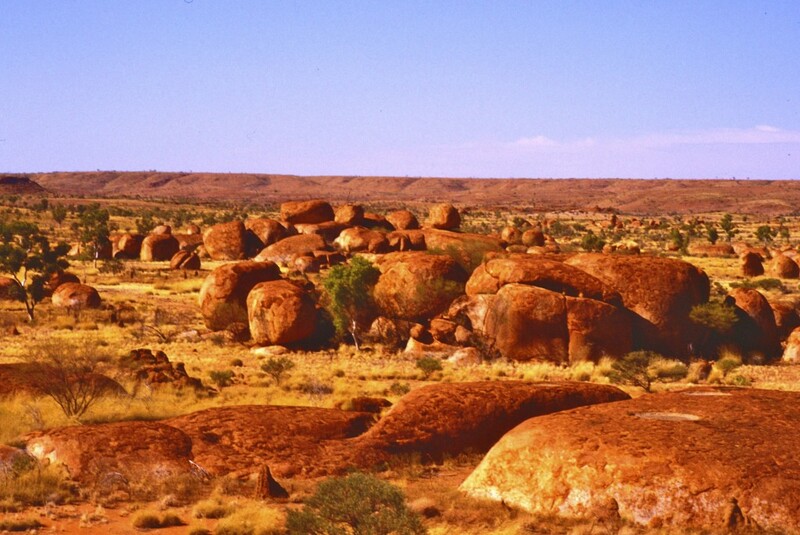 The large town closest to Australia's centre is Alice Springs, also known as "The Alice". 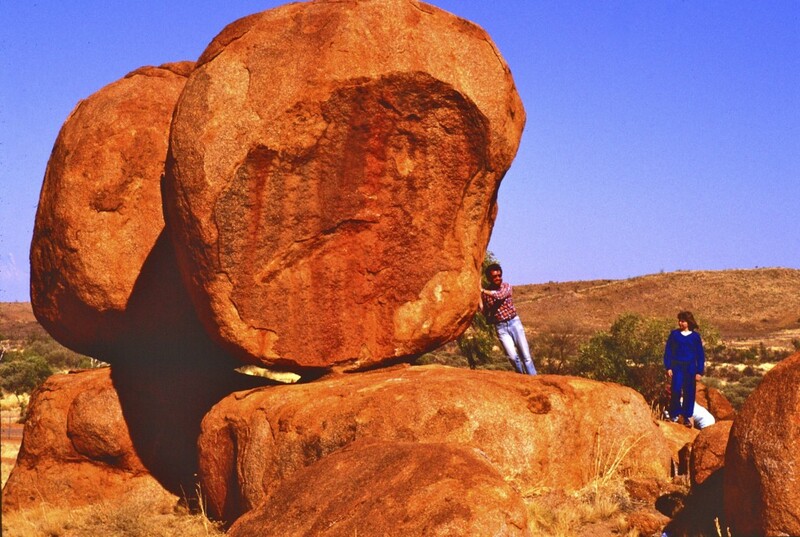 The site is known as Mparntwe to the traditional owners of the land, the Arrernte people. 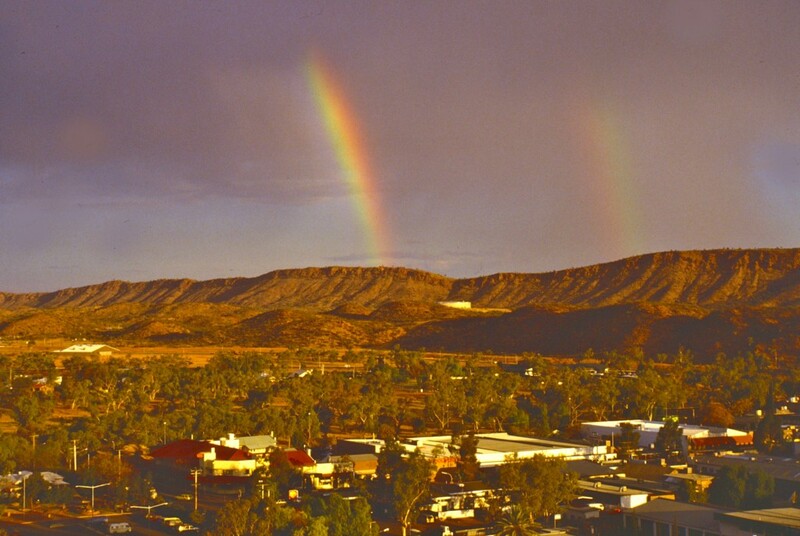 On our visit, we were able to see a rare rainbow across the town's surrounding MacDonnell Ranges. Travelling south from Alice Springs, we turned west to reach Uluru (also known as Ayers Rock) standing high above the ground in this low desert country. You can see the size of Uluru in the next photo. 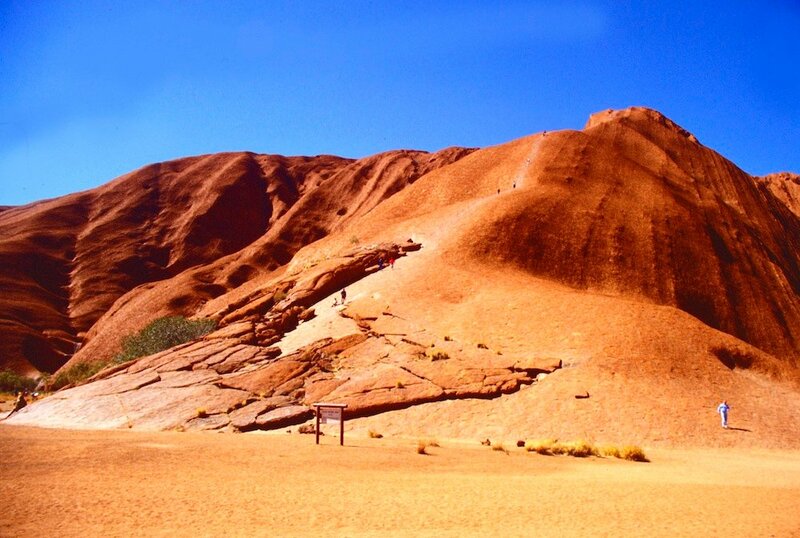 Uluru is sacred to the traditional owners who would never climb the rock but they don't stop visitors who wish to climb but prefer people to respect their beliefs. Visitors have to take care to follow the trail because the climb can be dangerous. 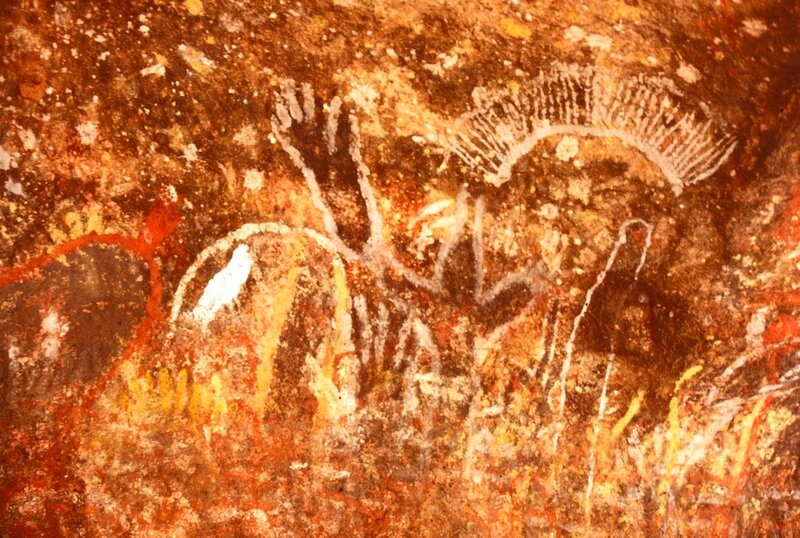 Many areas around Uluru have traditonal art work painted on the rock. Some areas have a low fence with warning signs asking visitors not to enter as the sites are scared men or women areas where only traditonal people should enter. The photo below was taken in an area visitors could enter. 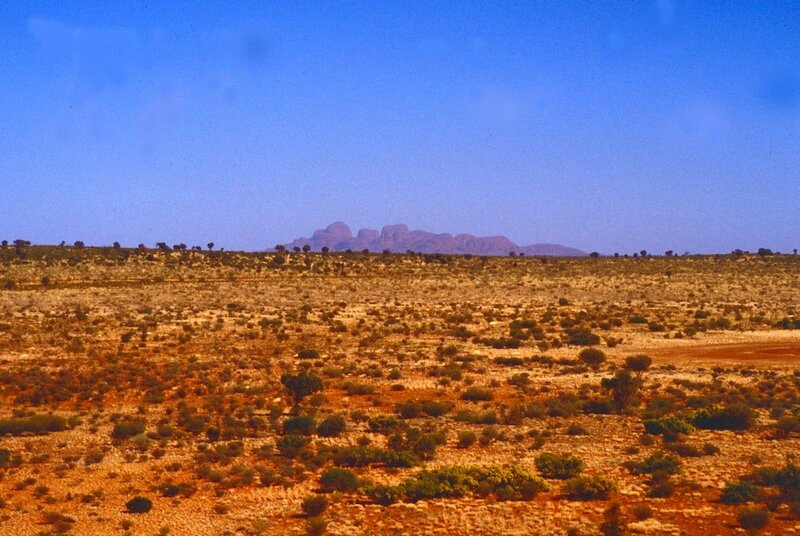 About 30 km (more by road) to the west of Uluru is Kata Tjuta (also known as The Olgas). 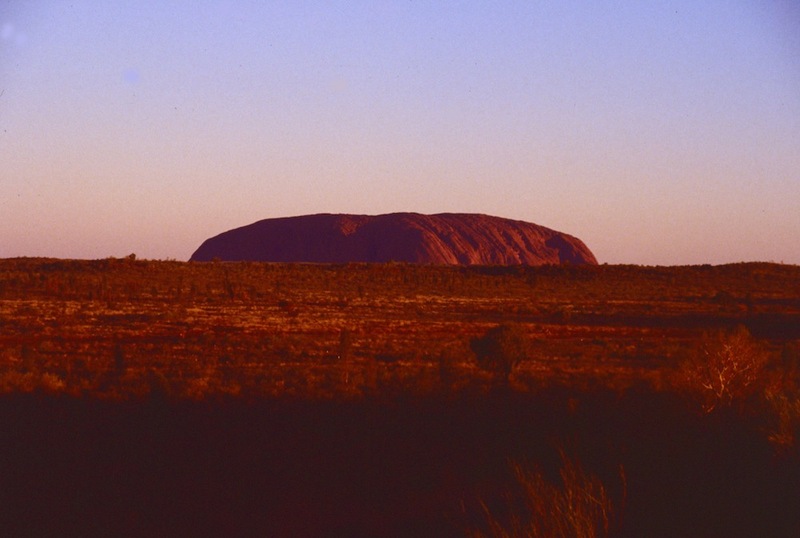 Like Uluru, these rock formations are huge and tower above the surrounding land. As we left Uluru and Kata Tjuta, we joined the main road south and passed through more flat country. 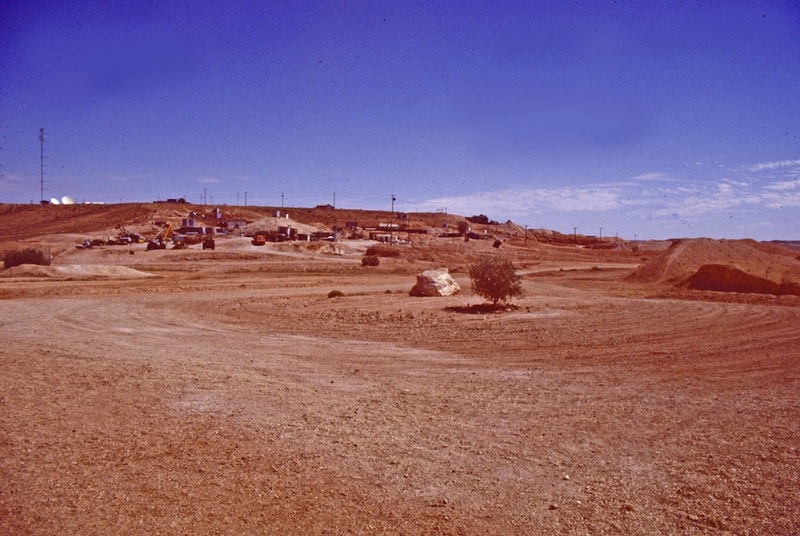 Eventually we reached the opal mining town of Coober Pedy. To escape the high summer temperatures, some of the town's people have built homes into the low hills. This photo was sourced through WIkimedia Commons. The information below shows the original author. 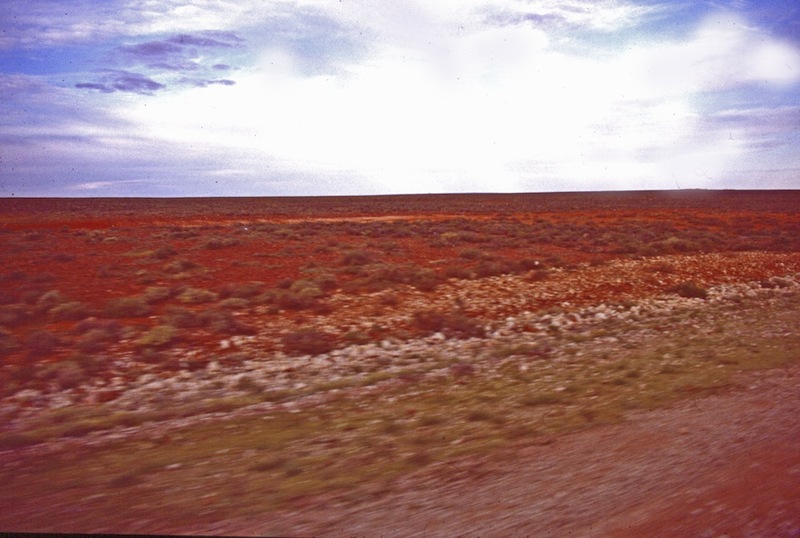 ...before heading east from Port Augusta back into the state of New South Wales and on to Sydney. 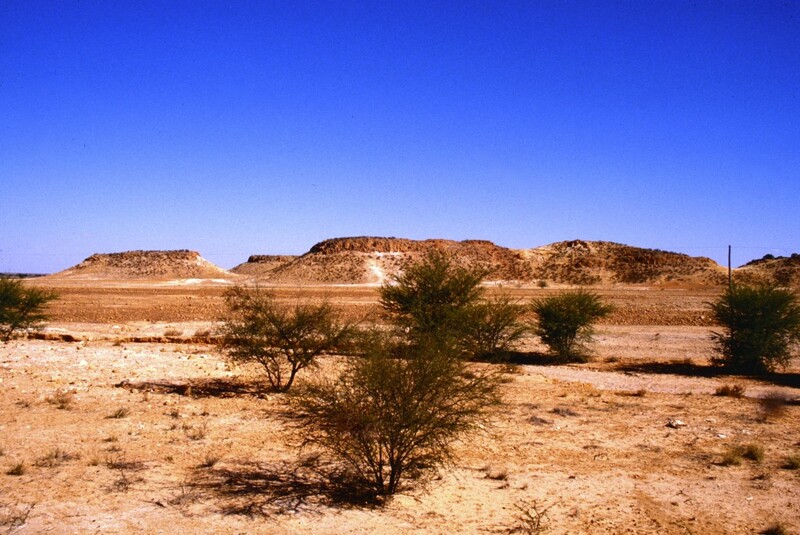 Australia is a very large country but much of it is arid (desert) or semi-arid (almost desert). Posted in Australia, Environment & Weather, Geography, Geology, One World, One People, Rocks and Minerals and tagged Alice Springs, Australia, Ayer's Rock, Coober Pedy, desert, Kata Tjuta, The Olgas, Uluru on January 16, 2014 by rossmannell. Thank you for the nice words you wrote on the Lend Me Your Literacy website. I liked looking at the photographs and would like to visit Australia when I’m bigger. I am really proud of myself!